CSC 325. 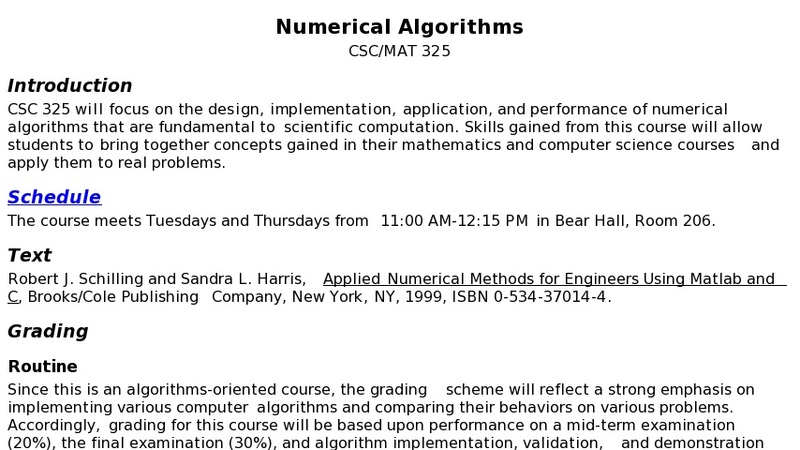 (MAT 325) Numerical Algorithms (3) Prerequisite: CSC 112 or 121, MAT 162. An introduction to the numerical algorithms fundamental to scientific computer work. Includes elementary discussion of error, polynomial interpolation, quadrature, linear systems of equations, solution of nonlinear equations and numerical solution of ordinary differential equations. The algorithmic approach and the efficient use of the computer are emphasized.